Drywall Ceiling Repair In Agoura Hills, CA - No More Cracks Or Holes! No matter how lovely and carefully put together your home is, if your ceiling’s drywall has become damaged somewhere along the way, it’s going to stand out. While it’s certainly harder for ceiling drywall to be harmed due to thickness and not being as accessible as the walls, it still may happen eventually thanks to wear and tear or settling. Whatever the cause there’s no need to let it detract from your household’s aesthetic when we can get it repaired right away like it never happened! We’ve been working in the area for years so you know you can count on us to do thorough work that lasts for a long time. Our experts would be happy to help you with your home’s smooth ceilings and get them repaired swiftly and sturdily with our high-quality tools and materials. We’ll examine the area to determine how far the damage extends, as well as ensure that there’s no studs, wires, or pipes that will need to be worked around for safety. The portion of the drywall that’s been harmed will be cut around with a drywall saw and taken out, along with the insulation briefly if needed. The new piece of drywall of equal thickness will be measured and cut to fit the area precisely before being installed with drywall screws. Joint compound and special tape is used to keep it in place, then it will be primed and painted. These types of ceilings require an extra step of having the textured paint scraped off the entire area to avoid any mismatching texture patterns before the repairs are begun. 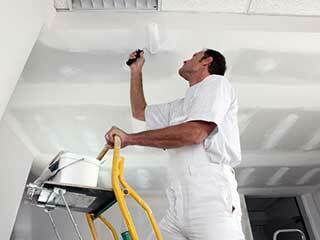 After they’ve been completed and the ceiling has been primed, we’ll use a paint roller with a textured sleeve to complete the job for you. Why wait to call Drywall Repair & Remodeling Agoura Hills when we can make your ceilings look perfect again sooner rather than later? It’s time to give them some TLC today.